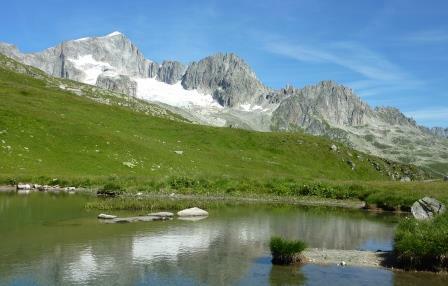 As at the start of the year 2013, our plans are gradually coming together. As usual, we will be away from Australia from May to September. It is most likely that our main destination will be Turkey. The size of this nation is intimidating, but as we make sense of it and its history, an itinerary will come together – doubtless, however, to be adapted to circumstances as we hit the road. Meanwhile, we enjoy a Sydney summer, with all its several attractions. By way of a preface to this blog, maybe a few reflections are in order. We had camped on the European mainland in our youth, before moving to Australia, and had come to love its beautiful and varied scenery. We came also to appreciate and learn from its extraordinary history, ancient and modern, brought to life by the cities, towns, battlegrounds, fortresses, castles and manors scattered so freely across each of its nations. 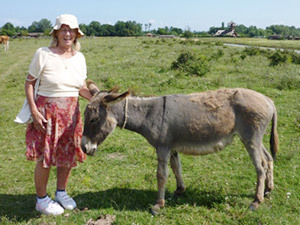 Following retirement from paid work in 2007, new adventures became possible. The idea of touring Europe in a camper originally arose while we were sailing the Mediterranean in the 1980s in our yacht, Cera. However, we had been constrained by the difficulty of venturing inland, not to speak of the daily need to study weather patterns, seek safe anchorage, and find suitable sources for provisions, water and fuel. 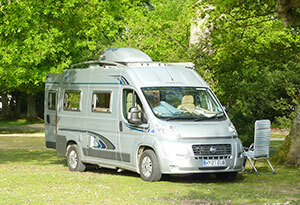 None of these are limitations when living in a campervan or motorhome. The vehicle we chose was a new van based on the conversion of a Fiat Ducato commercial. There are several such conversions on the market, and the Ducato is now also the industry’s favourite as a basis for motorhomes such as the Winnebago, which are basically caravan-style accommodations built on a Ducato cab and chassis. 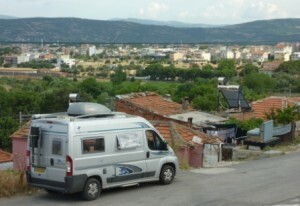 Having done the research, we decided on a Ducato van conversion for several reasons: it is relatively compact, making for far fewer problems parking and driving in the narrow streets and roads inevitably encountered in Europe; and it drives like a large car, easily keeping up with traffic at all legal speeds. Disadvantages? Of course it is smaller inside than a full-blown motorhome, but having lived for years on a boat with only a bit more room, that was not a problem. The addition of a roof-top box after the first year eased the storage pressure. The fridge is small, but because we shop as we go, which is part of the travel experience, Norma can cope well enough. We have to make up the beds each night, but anyone who cannot spare ten minutes a day to do that has a problem with time management. It has a gas stove, water tank, toilet, and small shower. We can be completely self-sufficient for days on end. We do not have a television, which makes us a bit of a rarity. We start each season with enough books to see us through, sourced mostly from charity shops and book sales in Australia and the UK. Our entire music collection is on the iPod, which plays through the cabin radio. We like to sit outside and read under the awning, especially in the long evenings of the European summer. Thus, the van is our chalet, villa or summer home for as long as we stay anywhere. Camp sites, when we choose to use them, range from a simple field behind a family house to fully equipped resorts with swimming pools and spas (not that we use these much). Increasingly common is free or cheap wi-fi (and there is always McDonalds!). 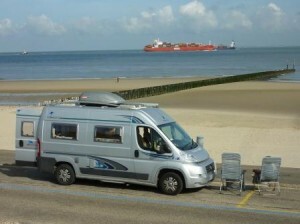 Many towns and villages in Western Europe provide cheap or free parking areas dedicated to motorhomes, close to the centres, with the hope – well justified – that campers will spend money in their shops, restaurants and cafes. In many beautiful places it is possible simply to stop freely off the road for a night or two, to gaze over the sea, the valley, or an ancient town. Travelling this way means no hassle with luggage or hotel bookings, flights, trains or bus schedules. Where we do use public transport is at the big cities, where we camp outside or on the fringes – there are always such places – and take the bus, tram or train into the centre. The whole lifestyle revolves on the principles of simplicity, flexibility and control. It suits us very well. Trip planning continues. We fly to the UK in late May, pick up the van from its storage place on a farm in Dorset, visit some relatives, get the van serviced and registered where we bought it in Southampton, then cross the Channel early the next week. We aim then to move reasonably quickly, by our standards, south-east across Europe, and down to Italy. At present, the best route to Turkey looks like including a ferry run from Italy to Greece, then across to Istanbul. That’s a detail which will no doubt evolve in time.